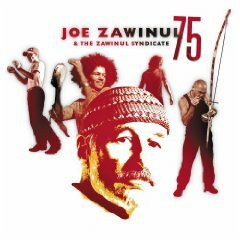 Nominations for the 52nd Annual Grammy Awards were announced last night by The Recording Academy, and Joe’s album, 75, was nominated in the category Best Contemporary Jazz Album. Other nominees in that category are Urbanus, Stefon Harris & Blackout; Sounding Point, Julian Lage; At World’s Edge, Philippe Saisse; and Big Neighborhood, Mike Stern. Joe’s post-Weather Report albums have been nominated several times, but have never won. Weather Report did win a Grammy for 8:30, and Cannonball Adderley won for the album Mercy, Mercy, Mercy.